(Bloomberg Opinion) -- Paris, Frankfurt and other European cities are rolling out the red carpet to welcome financiers quitting London as Brexit puts the U.K. capital’s free access to business on the continent in jeopardy. Rival hubs have love-bombed firms with promises of tax breaks and sweeteners. But they need to be on guard against a regulatory race to the bottom — as the U.K. knows to its cost. As large global banks start popping up on the same skyline, their influence on politics and the economy grows. 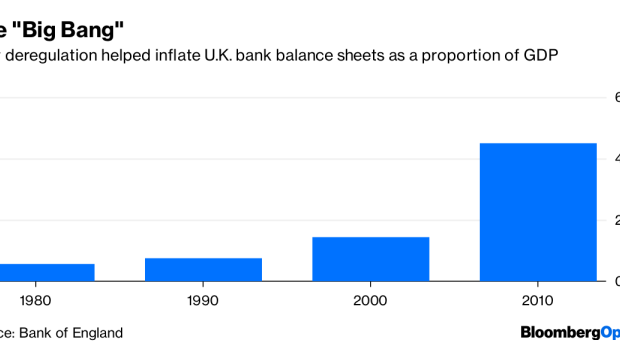 London’s financial deregulation drive under Margaret Thatcher, endorsed by New Labour in the 1990s, saw U.K. bank assets swell from 55 percent of GDP in 1980 to 450 percent in 2010. After the financial crisis of 2008, Gordon Brown, Tony Blair’s successor as prime minister, admitted that bankers had lobbied — successfully — for less regulation. It proved to be a costly mistake for British taxpayers. It is therefore disturbing to hear UBS Group AG representatives draw a connection between the bank’s legal woes in France, where it is on trial for encouraging rich clients to hide cash abroad to dodge taxes — allegations the bank denies — and the attractiveness of Paris as a financial center after Brexit. As dog whistles go, this will have no trouble reaching the human ear. Drawing attention to the potentially large size of a legal fine is one thing — France is seeking 1.6 billion euros ($1.8 billion) in compensation from UBS — but arguing that financial firms will move elsewhere depending on how the judiciary exercises its independent powers looks too much like a threat. Any firm that imagines that Europe’s capitals will soften their stance on alleged financial wrongdoing to win business post-Brexit is thinking wishfully. In Germany, an investigation into controversial trades that’s estimated to have cost taxpayers more than 10 billion euros is gaining traction, with BlackRock Inc. becoming the latest firm to be raided, according to Bloomberg News. Europe’s cities are right to keep up their guard and learn from London’s history. Even U.K. regulators are unwilling to endorse a post-Brexit bonfire of the regulations, because they know that a well-regulated financial hub will be a more successful one in the long run — regardless of threats from some firms to up sticks and leave. Brexit doesn’t give the rest of Europe carte blanche to race to the bottom.